About this object Garner of Texas served one term in the Speaker’s chair before being elected Vice President in 1932. On this date, the 72nd Congress (1931–1933) convened as Clerk William Tyler Page called the House to order at noon on opening day. The proceedings were historic. Elections in the fall of 1930 had provided Republicans with a slim majority in the chamber—218 Republicans, 216 Democrats, and one Farmer–Laborer. But between Election Day 1930 and the opening of the new Congress 13 months later, 14 Representatives-elect died. In the subsequent special elections to fill those vacancies, Democrats gained a majority advantage as voters registered their displeasure with the deepening Great Depression and the response to it by the Herbert Hoover administration. On opening day, Democrats organized the chamber with a 219 to 212 advantage, with several Members from third parties. Among the late-Members mourned was popular Republican Speaker Nicholas Longworth, who had passed away on April 9, 1931. House Chaplain James Shera Montgomery eulogized Longworth in the opening prayer, motioning toward a portrait of the late Speaker at the foot of the rostrum. “Before us is an image of our most notable one. A sad and mournful yesterday dictates our sorrow. 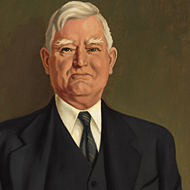 Through the years he camped with us in the embrace of a sweet and beautiful fraternity.” Moments later, Longworth’s longtime friend, Democrat John Nance Garner of Texas, was elected Speaker of the House and sworn in by the dean of the House, Edward Pou of North Carolina.